Next time they’ll try to be ready. The fate of a 105-year-old house at 15th and Haskell, scheduled for demolition this summer, has prompted local developers, historians and especially preservationists to talk about ways to better save the city’s historically important structures. “We want to identify potential paths of development and identify specific historical properties before it’s too late,” said Carol Von Tursch, a former president and member of the Lawrence Preservation Alliance. She said the alliance’s resolve came out of discussions about the house at 1503 Haskell Ave., which is on land originally owned by a Lawrence founder. The house sits on the outer corner of the under-construction Hanscom-Tappan Addition, a 10-acre development of 33 homes. Allen Belot, project architect, campaigned to save and restore the house but then deemed the project financially unfeasible after outside consultation. It has been “demolished by neglect,” he said. 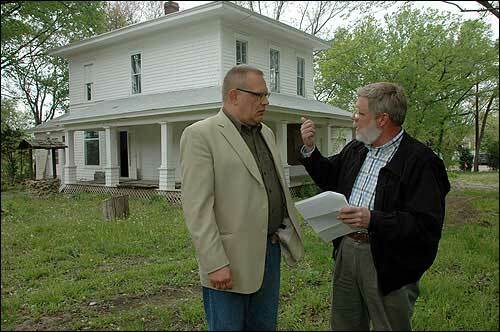 Back in January, Belot encouraged Greg Seibel, project manager of Ad Astra Coop at 1044 Ky., in his interest to restore the house. Now the lots’ real estate agents, with Re/Max, have constructed another obstacle for Seibel to get through. In his attempts to save the house, Belot originally believed it to be the homestead of Oliver A. Hanscom, who arrived in Lawrence in 1854. City records show that Hanscom and his wife, Anna Tappan Hanscom, lived on the property but not necessarily in the house. And the house was built in 1900, 46 years after Hanscom acquired the land and began gradually selling it off, piece by piece. James Grauerholz, left, and Allen Belot, a local developer, talk about the history of the Hanscom house at 1503 Haskell Ave., which is scheduled to be razed to make way for a new development. The new development on the southwest corner of 15th and Haskell will include a small park the size of two residential lots, where Belot will post a plaque to honor the history of the Hanscom family. News of the development inspired a flurry of research about the site and the couple who lived on it. James Grauerholz, a Kansas University lecturer in American studies and local historian, initiated research of Hanscom’s story. Hanscom is not mentioned in many accounts of early Lawrence, but the significant supporting role he played has been pieced together through Grauerholz’s research. Hanscom, in the second group of settlers sent to Lawrence by the Emigrant Aid Company, reached Lawrence from Boston on Sept. 15, 1854. He was 22 years old at the time. In Lawrence, the group quickly got to work. Charles Robinson, who went on to become Kansas’ first governor, assembled the Lawrence Assn. The organization, for which Hanscom was a trustee, soon laid out the city and auctioned off farm claims. Hanscom received his 160-acre quarter through this arrangement, not bidding on the land near what is now 15th and Haskell but being chosen to protect it from pro-slavery outsiders after it was not sold. Hanscom left his mark on the city’s library beginnings. Just a month after arriving to the area, Hanscom helped initiate the coming together of a cultural and literary society – probably the first in Kansas territory – called The Kansas Athenium. The group’s first meeting was held in a tent shared by Hanscom and another settler. The group was short-lived but paved the way for Lawrence’s first circulating library, which opened in 1865. Two days after the first Athenium meeting, Hanscom served as clerk at a meeting to form the first church in Lawrence. The Rev. Samuel Y. Lum, a settler sent west by the Home Missionary Society, held the meeting in “Oread Hall,” a large tent for religious services. Hanscom held a candle for the writing of the church’s creed and constitution. The church was soon named Plymouth Church, paralleling the settlers’ circumstances to those of the pilgrims at Plymouth. The church’s current sanctuary at 925 Vt. was built in 1870, making the church the oldest in the state. Also in city government, Hanscom was a member of the Lawrence Common Council. The council laid out the city’s boundaries and lots on Oct. 17, 1854. Arriving in Lawrence shortly after Hanscom, in late September 1854, was Anna Tappan, Lawrence’s first single woman. She went on to marry Hanscom in 1857. She traveled from her home state, New York, with the Lum family and was the protege of Sarah Robinson, wife of the state’s first governor. Following a three-year courtship, Tappan and Hanscom married on Oct. 13, 1857. The date was Hanscom’s 26th birthday. The Hanscoms had five children, born between 1862 and 1868. Lawrence records show little trace of the children after moving out of their parents’ home. Anna was buried June 6, 1912, in the city’s Oak Hill Cemetery, and Oliver was buried Nov. 4, 1914, beside her.